WASHINGTON (CNS) — The U.S. bishops’ March 19 designation of a center in Washington as the St. John Paul II National Shrine reflects U.S. Catholics’ love for the late pope, said Archbishop Joseph E. Kurtz of Louisville, Ky.
As president of the U.S. Conference of Catholic Bishops, he signed the decree declaring the designation for the site of the former John Paul II Cultural Center. It takes effect April 27, the day Pope Francis will canonize Blessed John Paul II and Blessed John XXIII. Liturgical celebrations, a reception and a gathering of young people will mark the occasion. “This national shrine is truly America’s fitting tribute and remembrance of his legacy,” Archbishop Kurtz said in a statement. 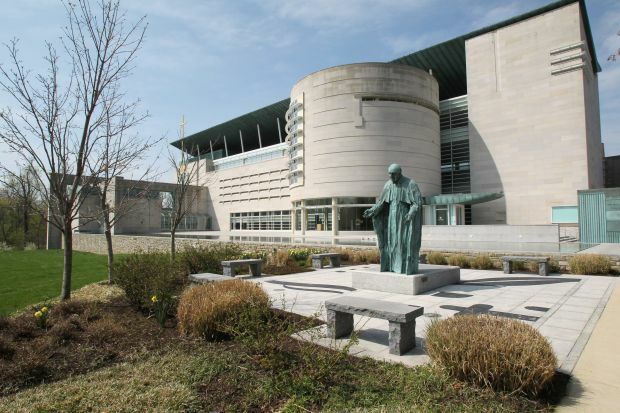 The center, which first opened in 2001 as a cultural center, named for the pope, with a research component, museum and gallery, sits on 12 acres in Washington’s northeast quadrant just steps from the Basilica of the National Shrine of the Immaculate Conception and The Catholic University of America. The Knights of Columbus took ownership of the facility in 2011, with plans to create a shrine dedicated to the pope and his contributions to the church and society. It is currently known as the Blessed John Paul II Shrine. Cardinal Donald W. Wuerl of Washington in 2011 blessed the Knights’ initiative and declared the site an archdiocesan shrine. In a statement about the national shrine designation for the facility, Cardinal Wuerl noted that Blessed John Paul had visited Washington in 1979. Three years earlier, as Cardinal Karol Wojtyla, the future pope paid a visit to the nation’s capital. A centerpiece of the shrine will be a relic consisting of a vial of Blessed John Paul II’s blood. The Knights received it from Cardinal Stanislaw Dziwisz of Krakow, Poland, longtime personal secretary to the late pontiff. According to a news release from the Knights, the shrine’s lower level will feature a 16,000-square-foot permanent exhibition on the pope’s life and teaching slated to open later this year. The main floor will be converted into a church, and the current chapel will serve as a reliquary chapel. Both will feature floor-to-ceiling mosaics. The shrine’s executive director, Patrick Kelly, said the shrine will be the premier U.S. site dedicated to the soon-to-be saint.